NEWPORT NEWS, Va., May 23, 2012 (GLOBE NEWSWIRE) -- Huntington Ingalls Industries (NYSE:HII) announced today that the Virginia-class submarine Minnesota (SSN 783) is "pressure hull complete," signifying that all of the submarine's hull sections have been joined to form a single, watertight unit. Minnesota will be the 10th Virginia-class submarine and the fifth delivered by HII's Newport News Shipbuilding (NNS) division. 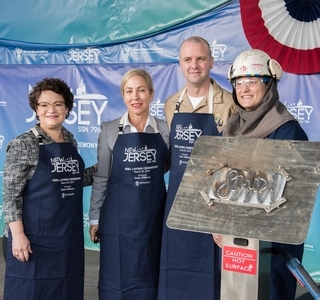 "This is a key milestone in the construction of the submarine," said Jim Hughes, NNS' vice president of submarines and fleet support. "Our shipbuilders and our partners at Electric Boat have put a lot of hard work into this boat, and it shows. Construction progress on Minnesota is two months ahead of where USS California, the last Virginia-class submarine delivered by NNS, was at pressure hull complete. The accelerated progress is due to an increase in work prior to hull completion in a more cost-efficient environment, resulting in a reduction in both the time and cost to complete the work." 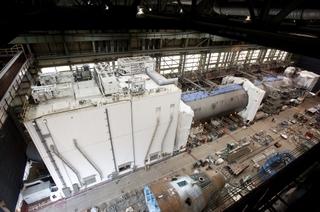 Pressure hull complete is the last major milestone before the submarine's christening this fall and delivery in 2013. 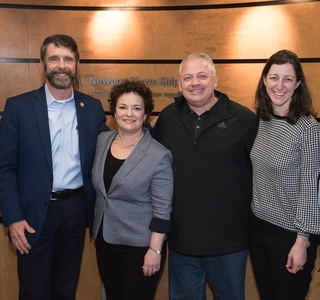 The contract to build Minnesota was awarded in 2003, and construction began in February 2008 under a teaming arrangement between NNS and General Dynamics Electric Boat. Minnesota is 81 percent complete. "This is a great day for Minnesota," said Cmdr. John Fancher, Minnesota's commanding officer. "The pride and professionalism of the shipbuilders evident in their workmanship energizes us. Minnesota's construction process has been an amazing experience already as nothing more than pieces of metal are transformed into a monument of technology. Every day, you can sense the anticipation and energy building within the crew as we step toward eventually taking this great warship to sea. We can't wait!"